Spectrum Project Space is an exhibition and performance space that functions as a laboratory for exploration and experimentation with an inclusive approach to creativity and is a site for multidisciplinary approaches to artistic practice. With an educational perspective, Spectrum Project Space attempts to reveal a range of reflective processes that underpin creative practice in all its forms. Spectrum both promotes and celebrates all forms of invention, experimentation and intuition irrespective of its outcome and therefore contributes to our understanding and appreciation of contemporary culture both locally and globally. Hollow Flight is a new exhibition by current School of Arts and Humanities PhD candidate, Harrison See, who explores the fractured sense of self in an increasingly digital age. 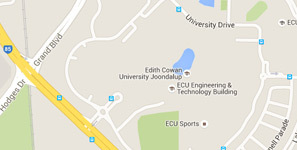 Spectrum Project Space is located on the Mount Lawley Campus at Edith Cowan University in Building 3, Room 3.191.